"Donald Kirk is attempting to break an illusion -- that the Vietnam conflict is an isolated struggle rather than a phase of a regional war....the most balanced and comprehensive yet to appear in a book. 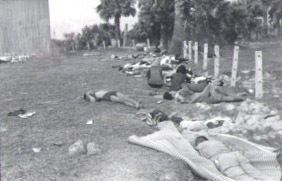 Sihanouk's dilemma from 1954 to March 18, 1970, is treated fairly, as are the reasons for voting the prince out of power. Kirk's command and application of the facts surrounding all developments...pay tribute to Kirk's professionalism." Written at the height of the Vietnam War in Saigon's Majestic Hotel. 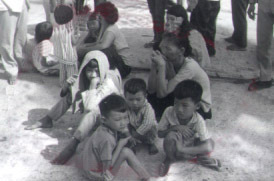 The title derives from President Nixon's declaration that U.S. forces, pouring into North Vietnamese base areas in Cambodia, did not seek a "wider war." "The author's delineation of the interaction between the four theaters of war is by far the book's strongest point....the best account so far of the complicated power play that overthrew Sihanouk. The resulting political-military situation, he rightly asserts, is the major challenge to the 'Nixon Doctrine. '....adds depth and perception to the problem and should be required reading for those who want to understand where the United States stands in Indochina and where it may be headed." "The book has an interesting point of view and should be well worth reading."." 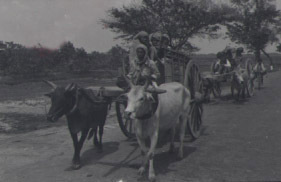 The war is seen "in the perspective of the centuries-old struggle among the peoples of that area. The Vietnamese have been steadily pushing southward and westward while the Thai have been expanding eastward. The Cambodians and the Laotians are caught in between. 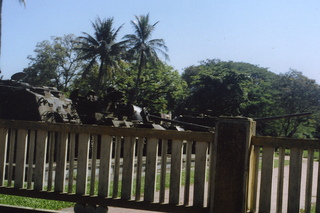 From this historical background, Kirk studies the roles which Cambodia, Thailand and Laos play in the present conflict. He discusses developments in each of these countries separately and explains the fears and hopes, as expressed by the various national leaders, which seem to reflect the historical struggles." "Donald Kirk...takes as a point of reference to an understanding of the interrelationship, the affirmation by President Nixon on April 30 1970 that the United States would avoid a 'wider war' by intervening in Cambodia....Mr. Kirk points up this facet of American involvement which reflects on American political purpose in excellent pieces of separate reporting on Cambodia, Thailand and Laos in which he discusses the domestic and international condition of those countries. 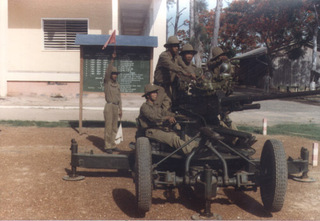 Mr. Kirk is concerned above all with the inter-connectedness of the war in Indochina and as such seeks to provide a historical perspective to underpin his narrative and analysis. He represents the most crucial aspect of the Indochina conflict as the rivalry between Thailand and Vietnam for control of the Mekong or more specifically for suzerainty over Laos and Cambodia. To the extent that the intervention of the United States, particularly in Laos, has served Thai interests, then such a thesis is unexceptionable....The strength and value of this work rests on the substantial reporting on Cambodia, Thailand and Laos." "Donald Kirk's Wider War bears many of the marks of being a journalist's 'quickie.' Completed in March 1971, it provides an account of developments in the Indochina region after Prince Sihanouk's overthrow and the subsequent spread of the war to engulf Cambodia. The book also essays an evaluation of the internal security situation in Thailand and gives some attention to Laos. The overall impression is of superficiality--despite the presence of footnotes...."
"Covering all the countries surrounding Vietnam, the author spent months in each locale, merging past with present conflicts. 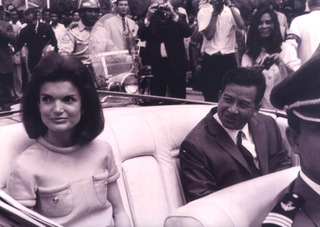 "A highlight is a detailed account of the fall of Prince Sihanouk, the rise of the American-supported Lon Nol regime and the invasion of Cambodia by American troops in May 1970. 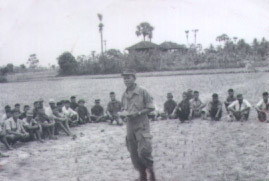 "The author was in Phnom Penh in the weeks after the fall of Sihanouk, accompanied American troops in the Parrot's Beak and Fish Hook as they roared across the frontier from Vietnam, and traveled through the countryside as the Khmer Rouge expanded their power. 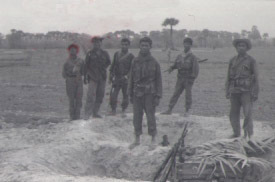 Matthew Ridgway evaluated Vietnam from the perspective of a military leader. Arthur Schlesinger viewed the country through the eyes of a historian. Donald Kirk's perspective was closer: Kirk was the man on the ground. As a correspondent for publications including the Chicago Tribune, Kirk had years of experience in Southeast Asia. In his 1971 book Wider War, Kirk never explicitly states his opinion on the U.S. role in Indochina. His analysis of the factors at play in the region, however, has held up remarkably well. 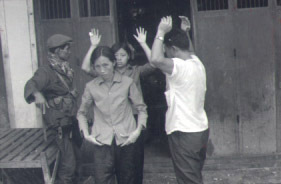 "'The American public, as well as most of the rest of the world, has long harbored the illusion that the Vietnam conflict is an isolated struggle rather than a phase of a regional war. This illusion should have been shattered in 1970 by the sudden expansion of the fighting across the Cambodian frontier, but Americans still seem to view that event as only an episode, a 'happening,' and interlude, as it were, amid the battles in Vietnam. "Sihanouk's image -- his womanizing, his hobbies as a saxophonist and filmaker -- contributed to the perception that he was not to be taken seriously as a head of state. In truth, however, his actions were not governed by caprice and whimsy: they were the result of cold, hard calculation. His opinions frequently put him at odds with the American government. "All in all, Wider War is a sober, balanced assessment of the situation in Indochina in the early Seventies. Could that situation -- and the subsequent destruction of Cambodia -- have been avoided? It is difficult to assess history, and even more difficult to assess a history that didn't happen. Trying to answer 'what if?' in hindsight is much like trying to predict the future. "It's hard to see the future. But as Kirk, Ridgway, and Schlesinger demonstrated, it isn't impossible." The publisher has granted the author all rights to the book. Although long out-of-print, used copies may be obtained through Amazon and Barnes and Noble or by contacting the author. Please get in touch if you'd like a copy. 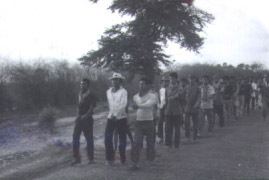 With South Vietnamese troops, members of Regional/Popular Forces, known as "ruff puffs" by U.S. advisers, south of the DMZ after the Spring 1968 offensive. Don's right arm was broken in a freak accident, riding an ammo crate out the rear door of a C130 cargo plane taxiing slowly at Khe Sanh during the siege earlier that year -- planes never came to full stop during North Vietnamese shelling. 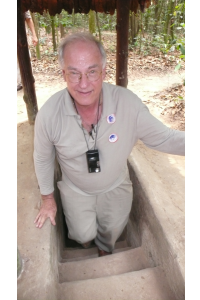 Former Vietnam correspondent Don North caught this image of Don Kirk emerging from tunnel at Cu Chi. Tunnel was widened to accomodate western visitors. 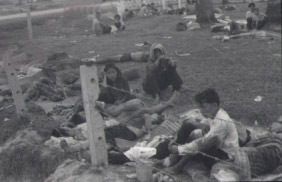 Survivors of massacre of Vietnamese by Cambodian troops at Prasaut, eastern Cambodia, April 1970, sit among the bodies. 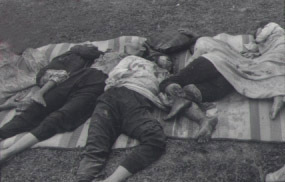 Kirk discovered the massacre after spending the night at the house of local governor. He sold his film to UPI's Phnom Penh bureau chief Jack Walsh for $20. One of the photos ran, with UPI credit, over Kirk's story on page one of The Evening Star, Washington, D.C., then in Time and Newsweek, also with credit to UPI. 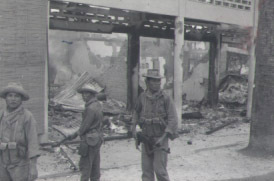 Cambodian soldiers patrol deserted street, above, raid a brothel, below. 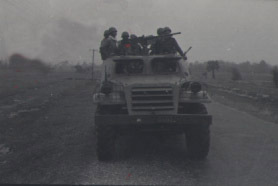 U.S.-armed Cambodian troops south of Phnom Penh, above, circling for briefing, below.